The Amazon sales & price analytical data that RT500 offers can provide great data whatever your needs. I thought I would compare the online sales of the marketing books written by a random selection of leading marketing gurus to see how they stack up against each other. Now I should point out that making too direct comparisons on the relative popularity of each book is not quite fair because the books were published at different times, and are different sizes and prices. For example Poke the box is only 95 pages and costs about $6, whereas Facebook marketing is 312 pages and costs nearly $20. That notwithstanding, it's interesting to see who's books are walking the walk when it comes to cold hard sales. 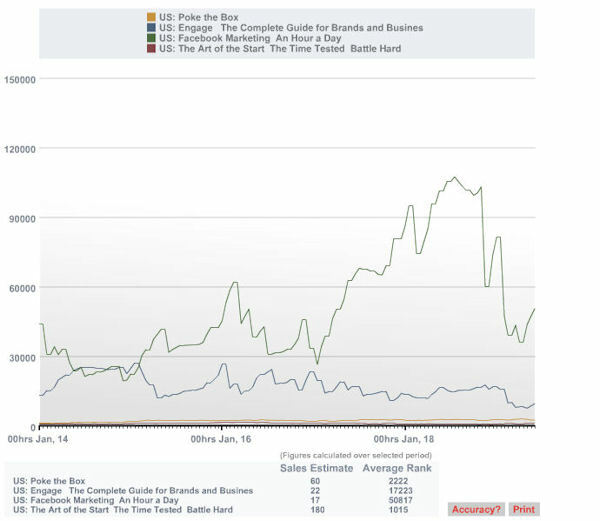 The above graph shows a comparison of Amazon sales ranks over a five day period on Amazon.com. The higher the sales rank, the less the book is selling. In other words, a sales rank of 1 means that book is the best selling book on Amazon. As you can see, Guy's Art of the start is outselling his marketing guru peers by some margin - in fact, 3 to 1 over his nearest competitor, Seth godin's Poke the box. What's more astounding is that Art of the start was published in 2004, while the other books were all published in 2010 or 2011. Not only that, but Art of the start is also one of the more expensive books, weighing in at around $18. Now it's quite possible that Guy has just been on Oprah, or something similar, leading to a temporary spike in his sales over this last week. But kudos to him either way - it's not easy to have an eight year old book frequent the top 1000 books on a regular basis. Of course, there are plenty of other marketing books by other marketing gurus to compare. For example Google+ for business by Chris Brogan, not included in this graph, weighed in with a respectable 27 sales at an average sales rank of 6761. While a few days of book sales data is probably not sufficient to really get a handle on who's winning the marketing book marketing competition, it's worth taking a look at what type of social reach each of the authors have garnered for themselves. Alright, so those are all pretty big numbers, but it's interesting to note that Guy has a substantially greater social reach with almost two and a half times as many Twitter followers as his nearest competitor, Chris Brogan. He also has a staggering 9 times the amount of Google+ engagement as his nearest competitor on Google+, Seth Godin. So there you have it. I won't make any deductions about why Guy's marketing book sold more than Seth's, Brian's, and Chris' combined over the last 5 days, simply because it's not a sufficient length of time to make too meaningful deductions. However, all these titles are tracked on RT500 for the next 3 months so I'll follow up towards the end of the tracking period. If you'd like to do some of your own market research on any products sold via Amazon, create an account and purchase a few subscriptions to track those products. Feel free to share your results with us, and we'll post the most interesting data to RT500.